While I have been listening to audiobooks for years, this is the first time I’ve actually tried one of these much-talked-about audio dramas from Audible Studios. Also known as audio plays or audio theater, these are very much like the old-school radio shows that were so popular in the 1920s-40s before the advent of television, though obviously their successors have come a long way since those days. Still, the idea is the same—with no visual aspect at all, the production relies completely on dialogue, music, and sound effects to tell the story. As this was brand new territory for me, I was happy to take my first plunge with a franchise that has always been close to my heart. The X-Files dominated my TV time in the 90s and was a show that made a huge impression on my childhood, so despite the disastrous final seasons, the terrible movies, and the most recent lukewarm miniseries revival, I always still find myself returning again and again. The X-Files: Cold Cases caught my eye right away for several reasons, and not least because it features a full cast including David Duchovny, Gillian Anderson, and several other actors from the original show returning to voice their respective characters. I was also intrigued because this audio drama is actually an adaption of the series of graphic novels by Joe Harris, and I’ve always been curious about those. Set after the events of The X-Files: I Want to Believe, these stories provide a glimpse into those intervening years leading up to 2016’s television tenth season. When a cyber security breach at FBI headquarters compromises the information of unsolved investigations, former agents Mulder and Scully are pulled out of hiding by Deputy Director Skinner to resume their past work in the secret department known as the X-Files. For Scully, the timing of the database breach is of an even greater concern when she learns that some of the stolen information may involve the child she secretly put up for adoption, and now the boy may be in danger. So, the nostalgia is there, but is it enough? The answer, I think, will depend on what you were expecting. I wouldn’t consider myself a super fan by any means, but I’ll admit my heart still gave an excited flutter to think about Mulder and Scully being on the case again, going back and forth with their cheeky banter. It’s less about the stories for me, but more about the full experience. Even audio dramas such as these are an opportunity for me to skip down memory lane in the hopes of recapturing and holding on to that old feeling, so yes—personally speaking, anyway—sometimes nostalgia is indeed enough. Even hearing that familiar Mark Snow theme song come through my headphones in the audiobook intro was enough to send a pleasant shiver down my spine. That said though, not all the stories in here were created equal. Like the first volume of the graphic novel it was based on, this audio drama contains a handful of episodes over a period of about four hours. The first story, ostensibly reintroducing Mulder and Scully back into game while also attempting to link this series to the main body of the lore was, in a nutshell, awkward as hell. Just as well that I wasn’t really looking for story cogency, because there was some major plot gymnastics going down in this first episode in order to tie the X-Files mythology together with the goal of bringing back as many old characters as possible. Calling it messy would be an understatement, but thankfully, not all the episodes were like this. Subsequent stories, particularly the ones that moved away from “mytharc” themes to instead feature more “monster of the week” horror/thriller narratives were a lot more entertaining and easier to follow. I especially enjoyed the return to Flukeman as well as the episode that took our characters on a trip to investigate a case in Saudi Arabia. As far as my first experience with an audio drama went, I loved it! The performances were amazing, with Duchovny and Anderson bringing their best even when the acting only involved voice work. The characters were true to themselves, and many times I caught myself smiling as I pictured Mulder’s deadpan deliveries or Scully’s epic eye-rolls. The music and sound effects were also mixed in so perfectly that if I closed my eyes I could almost imagine seeing everything play out like it was a TV episode. That’s not to say everything was flawless, because whenever you deal with adaptations, especially from a visual medium to an aural one, it’s inevitable that you’ll encounter some hitches. You’ll get the odd scene where the actor has to talk clumsily to themselves to make up for the listener not being able to see what’s going on (“I’m wearing the same clothes, and here’s the same bullet hole in my jacket….but oh, my arm! There’s not a scratch!”) but on the whole, I think the creative team did a really good job adapting the comic in spite of the limitations. In sum, I had a great time with this audio drama and would do this again in a heartbeat. 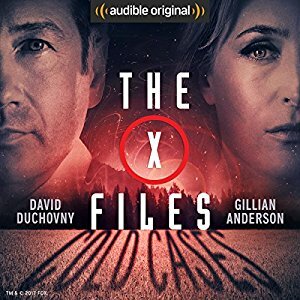 While this wouldn’t be the best place to start your journey if you’re new to the X-Files franchise (mainly because there’s so much of the original show’s mythology involved), I definitely would not hesitate to recommend these audiobooks to fans like me who aren’t quite ready to let go of the magic just yet. I still want to believe! Needless to say, I’m already highly anticipating the next audio drama in this series, The X-Files: Stolen Lives. I hadn’t even know that Torchwood has an audio drama series! Well, actually, now that you mention it, I might have seen some of them around, but I thought they were just regular tie-in novels in audio format! Audible has a surprising amount of clout to pull off these things! They did a full cast audio drama of Joe Hill’s Locke and Key as well, using an all-star cast. I feel like I’ve heard The X-Files mentioned a lot in my lifetime but I don’t actually know what that is. 😀 A TV show from the 90s, good to know. It sounds like you enjoyed the story and you enjoyed the audiobook experience. One day, I am going to try an audiobook. I’m so glad you enjoyed this one! I’ve listened a couple of dramatized Christie books from Audible and they were pretty good. I’m also a fan of X-Files and I’ve been wondering if this story is worth getting. Thanks for the review. And you’re welcome, I hope you get a chance to check out these X-Files audio plays! Oh, I used to love the x-Files and a trip down memory land does sound like good fun, glad you enjoyed this one. I find it so cool that you do audio book reviews!